I keep a list in my Notes app on my phone of all the whiskeys that I want to eventually try. Some of them on this list are readily available, and I just haven't gotten around to trying them yet. Others are a little more difficult to find. However, there are certain releases that I don't bother putting on my list because, quite frankly, they are no-brainers when I find them. 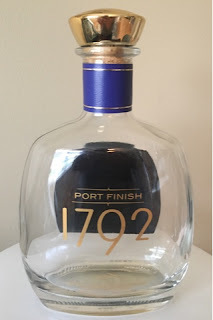 At only $44, and with only one left on the shelf, the 1792 Port Finish was one of these no-brainers. I knew it was released, but I had never seen it in the wild before then. Given that it's a special release and at a relatively easy-on-the-wallet price, I honestly didn't expect that I would stumble upon one. When I did happen to stumble upon a bottle, there wasn't a moment's hesitation to grab it. I'm not going to bury the lead on this one. This stuff is incredible! The port influence is very noticeable on the nose. However, the nose on this is one of the most complex that I've ever enjoyed. It's packed with dark fruit and plum notes, but the traditional vanilla and caramel flavors are readily present as well, and they all blend together perfectly. On my first sip, I couldn't help but notice how incredibly smooth this is. It's not a high proofer, but it still had absolutely zero bite. Rather it had a velvety, silky smooth mouthfeel that coated well. The fruit forward profile of this bourbon seemed to go perfectly with the texture, too. Grape and plum were at the forefront of each sip, showing the strong influence of the port. Despite being fruit forward, though, the vanilla undertones seemed to balance it out perfectly. If you're looking for something spicy, this is not your bourbon. However, if you like something on the sweeter side that is not going to be overly or sickly sweet and will offer a lot of complexity and depth, then this is where you want to go. Finished bourbons can so frequently be overwhelmingly influenced by the barrel in which they are finished. Barton 1792 got the balance of the sweet port influence perfect with this one. I was truly sad to pour the last drop. Even as I sit here and write this, I wish I could pour another glass. By all means, if you find a bottle on a shelf somewhere, grab it. At this price, it's a can't miss!